As I was having trouble coming up with ways to start my bio, I decided to take a look at some of the bios written by other DR members. Nearly every one I read had these or similar words in the first three sentences: “I grew up” or “I come from.” So rather than break with the status quo: I grew up a poor black child in Alabama. Oops, that was Steve Martin’s character Nevin in “The Jerk” not me. Rather, I grew up in the suburbs of Chicago and have a “Saturday Night Live”-imbued sense of humor. My folks and the bulk of my extended family are from central Pennsylvania. Mom and Dad still live in Chicagoland. Dad is a civil engineer and is very active in the church. Mom has taught all ages and currently teaches at a Catholic girls’ school. 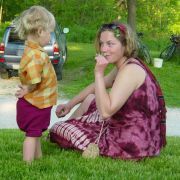 The eldest of my siblings, my sister Jen, lives not far from my parents with her two sons. The middle child, my brother Chris, is a Presbyterian minister in Birmingham, Alabama, and lives with his wife and son. In addition to the influence of the varied personalities in my family, many other things shaped the person I am today. Religion, college, relationships, and an initial foray into the work place, to name a few. I grew up in a religious household. Before high school, I was active in our church youth group and choir. During my first two years in high school we lived in Jasper, Alabama where I participated in the youth groups of two churches, participated in and assisted in leading a daily bible study, and attended three church services weekly. Since the latter half of high school, though, I have been exploring other schools of religious thought including Hinduism, Buddhism, Rastafari, Islam and Paganism. Sometimes you have got to try them all on before you find the one that fits. The one that fits me best is a dedication to earth and humanity that doesn’t seem to mesh perfectly with any of the faiths I have examined. At this point, I am happy being non-theistic. Having recently visited with some friends from college, my thoughts on the time that I spent there are glowing. I survived high school, but left all but one close friend behind the day I left for the University of Missouri. For the first time ever, it seems, I discovered kindred folk, the freedom of ‘being on my own,’ and a field of study that interested me. I chose urban forestry as it was the most ecologically groovy course of study in which I had the greatest potential to be outside doing nothing but looking at trees. But a job in urban forestry would have had me wearing a matching skirt or pantsuit to meetings with local officials to ensure that trees, shrubs and grass where properly co-mingled with asphalt and concrete in the Wal-Mart parking lot. So instead I got a job working for the University of Missouri Center for Agroforestry. (Agroforestry is a system of land use practices that combine traditional agriculture and forestry.) This job entailed doing things I really enjoyed, like working with landowners to establish agroforestry practices on their land, extolling the benefits of agroforestry at conferences and trade shows, and staying in the comfortable womb of the university environment for a while longer. But the hours in front of the computer, the resource intensity of university office practices and some significant emotional challenges led me to reconsider the university environment, or any government job (the bulk of what is available to a forestry grad.) Connections I had made in the alternative agriculture scene led me to my first experience at Dancing Rabbit, an organic gardening internship in 2001. During my time at Dancing Rabbit as an intern, I got much needed space from unhealthy relationships and found a place that offered ways for me to live at a level of ecological sustainability that more closely matches my values. I also found individuals (including my now partner, Ted) who offer kindred connections of a different and in some ways more complete sort. That fall brought my departure from DR and had Ted and I landing at his brother’s home outside of Washington, DC. After several months in DC, Ted and I moved to Maine to experiment with homesteading on land he owns along with his brothers and parents, and consider locations for such a life. Our time there was filled with joys and challenges that strengthened our relationship and encouraged both of us to think strongly about returning to DR. A trip to visit DR in June of 2002 closed the deal for me. Returning to Maine, I came to find Ted had developed the same thoughts. In October of 2002, we sought membership to begin the following spring. A journey (my first travel off of this continent) throughout the South Pacific occupied us for the winter, though we spent much of our time on trains and buses musing about the life we might build when we arrived at DR.
April 2003 found us here at DR, this time as members committed to building community with others and a shared life dedicated to ecological sustainability and social justice. Here, I regularly feel challenged to continue to explore the ecological and socio-political implications of my life choices. While challenges like this seem overwhelming to me at some times, I am constantly reassured by the support of others with whom I am building community. Cooperating with Ted and Tamar, another DR member, to build a closely-knit community (Ironweed Co-op) founded on shared values has been very satisfying and fruitful. In the years to come, I have my sights set on finding ways to incorporate my interests in natural childbirth, alternative child rearing and schooling, and home-based industry into my daily life. I am trained as a doula (childbirth labor assistant), but haven’t found a way to incorporate that into a life currently peppered with construction and gardening tasks. Progress on the construction of Ironweed’s shared kitchen, abundance in our shared garden, and fostering closer bonds with others continues to bring me great satisfaction and assurance that I am on the right path.